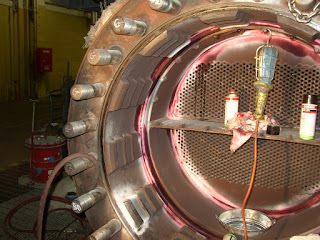 The photo below shows a high pressure feedwater heater which has been condemned. Cyclic operation will destroy improperly designed Feedwater Heaters. Contact AM-EX for our state of the art designs to ensure FEEDWATER HEATER integrity during cyclic operation. AM-EX utilizes specialized desuperheating zones, drainscooling zones, and special channel designed specifically for cyclic operation. The specific photo above is a breech-lock design. These types of designs, are older designs which have a tendency to crack, and are not recommended specifically in cyclic operations. The crack propagation is of particular concern for load following plants which experience rapid power plant cycling. In addition, the breech-lock design is difficult to service due to special equipment requirements. The above and below photos are of a high pressure feedwater heater in cyclic operation which was condemned (and replaced with an AM-EX High Pressure Feedwater Heater designed for cyclic operation) due to the extensive indications and channel failure. Of particular note is the crack propagation of an undersized knuckle radius and inadequate breech lock lug design. Contact AM-EX at Sales@amexservices.com for details and solutions to problems such as this. This article has been written by Kellen Muldoon - Director of Global Sales - Feedwater Heaters - American Exchanger Services, Inc.